The beetle and the bee is an ESL adventure game for kids and young adults where you control a beetle which wants to collect the tasty strawberries and avoid the stinging bee. Have fun while you learn your English vocabulary and grammar! Learning English as a second language doesn't get better than this! 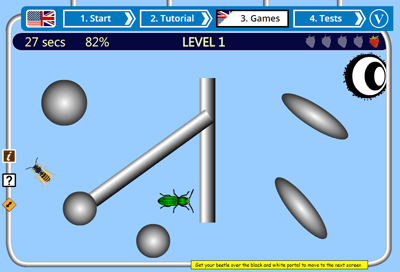 Choose "The Beetle and the bee" from the English games selection page. When you do, a box will open with a English multiple choice question for your selected topic.